Alright football fans. 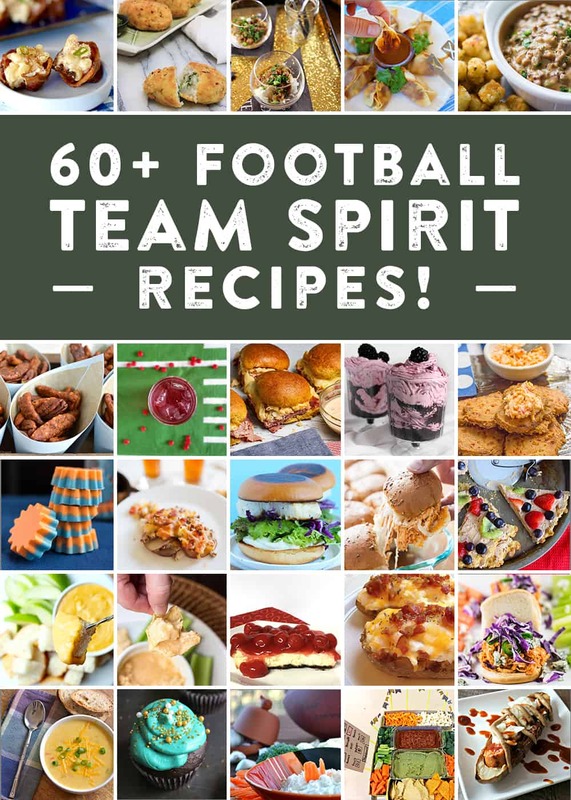 Your favorite Foodie Football Fans have joined forces to bring you yet another awesome roundup of NFL Team Themed dishes! Be sure to scroll through and find your favorite team’s dish and try it out for a game this season! 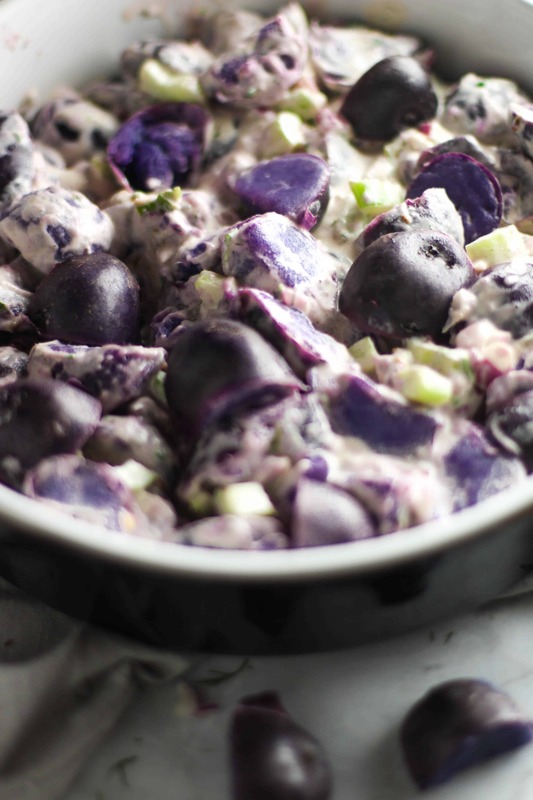 I’m excited to bring you this Purple Potato Salad inspired by the Baltimore Ravens! 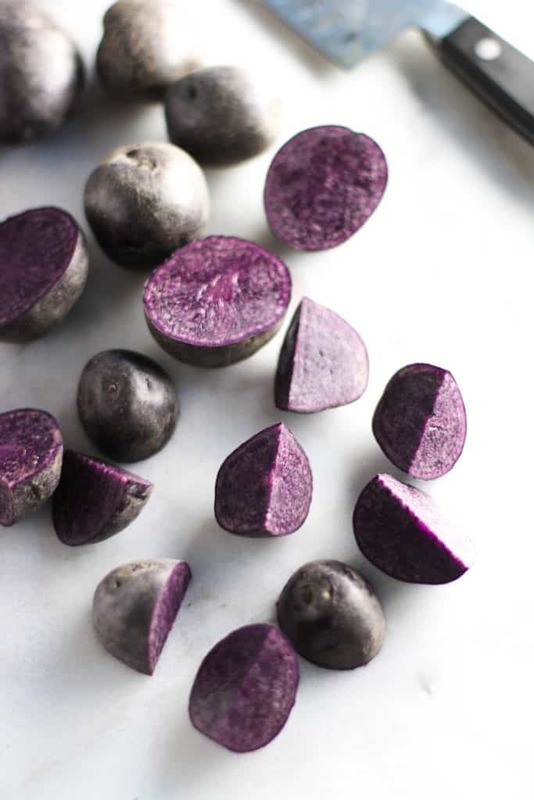 It’s a great and simple way to represent Birdland with these gorgeous purple potatoes. 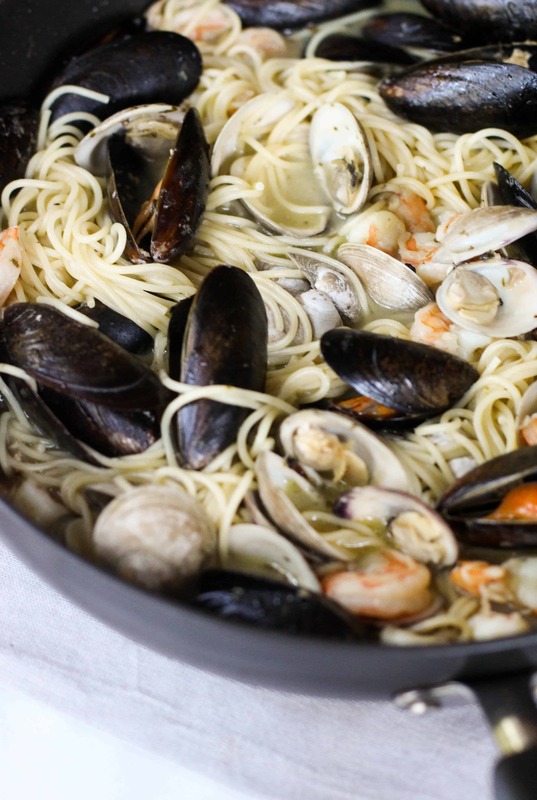 The whole dish comes together in about 20 minutes so you can’t ask for much more than that! 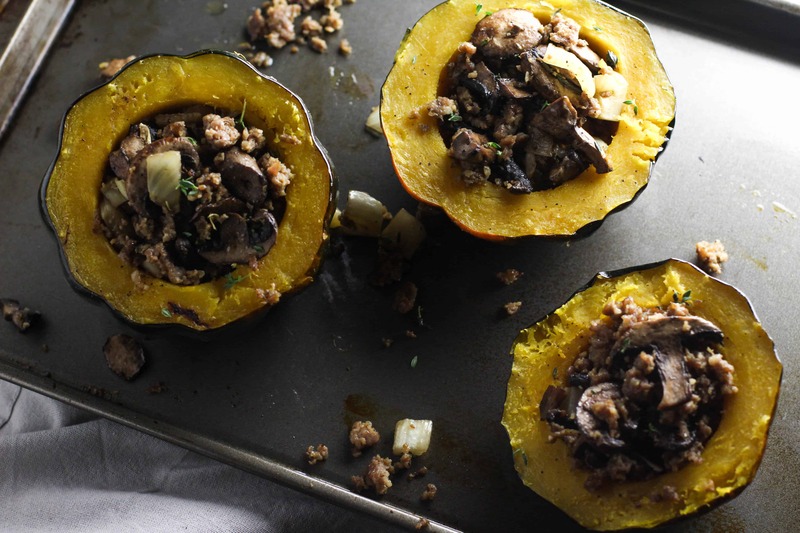 The great thing about this dish is that it fits in with the Halloween time too! So even if you’re not a Ravens fan, you can bring this dish to a Halloween party and spook all of your friends. The sauce definitely covers up a lot of the color so you might want to half it if you’re looking for a mostly purple dish. The potatoes dye some of the mayonnaise mixture purple, but it’s definitely not the same as having the purple potatoes out. When I made it, I saved a handful of the potatoes to place on top to really bring out the great purple color! The sauce is a mixture of mayonnaise, Dijon mustard, and vinegar so you’ll definitely get the acidity from that. Add in extra red pepper flakes if you’re looking for extra kick or try paprika! 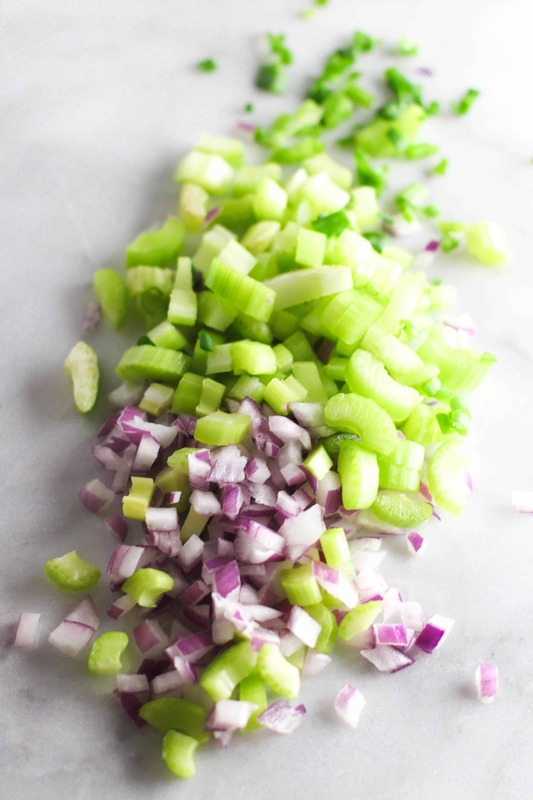 Top with extra dill and celery to bring in some of the great green colors too. Next time I want to try adding chopped up avocado! You could potentially try making the sauce with avocado instead of mayonnaise if you’re trying to make a healthier version. Since the sauce is mayonnaise based, if you’re planning on bringing it to a tailgate try and make sure it stays cool! Put some ice in a bigger bowl and sit the bowl you have the potato salad in it to try and help. 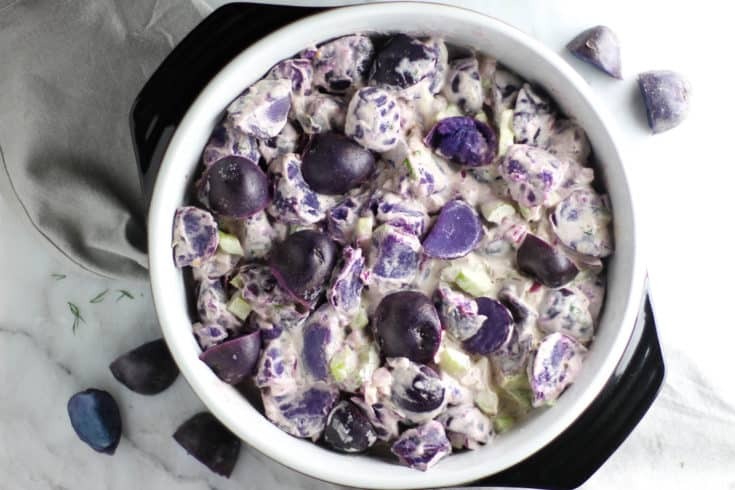 Now that you’re totally convinced to cheer for the Ravens and make this Purple Potato Salad… Check out the rest of these great dishes! 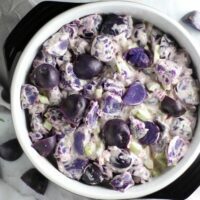 This Purple Potato Salad is an easy dish to throw together, bring to a tailgate, and show your team spirit! Bring large pot of salted water to a boil. Add in potatoes and cook for 8-10 minutes or until fork tender. Drain in a colander and rinse under cold water to stop cooking. Set aside and allow to cool. While potatoes are cooking, add mayonnaise, white vinegar, dijon mustard, red pepper flakes, dill, salt and pepper to a large bowl. Mix in red onion, green onion, and celery to the mayonnaise mixture. Add cooled potatoes to mayonnaise mixture and mix until coated. Serve and enjoy!